The Reserve Bank has revealed that "strongly rising" house prices helped tip its hand when pushing up interest rates this month, saying prices have "gained momentum" and are climbing strongly "for all but the bottom segment of the market". The unusual discussion of house prices in the section of its board minutes devoted to "considerations for monetary policy" suggests the timing of future rate hikes will depend in part on its view of the strength of real estate prices. The minutes describe the market for established homes "very buoyant", with auction clearance rates "at high levels, notably in Melbourne". It says although loan approvals have declined somewhat, as would be expected with higher rates, nationwide prices "continued to grow at a rate of close to 1 per cent per month in December and January". "The minutes show house prices becoming one of the key indicators watched by the Bank"... said Macquarie Group interest rate strategist Rory Robertson. "A month or two ago you could have the view that house prices were decelerating. They were coming off double-digit annual growth. But in the lead up to the March meeting it became clear there had been no deceleration. The Reserve seems to be taking the view that if house prices are rising rapidly, rates are too low." "Some analysts think the Bank is actually targeting house prices but I think it is more that if house prices are rising rapidly it takes it as a sign that the economy is doing well." "Until recently you couldn't get good house price data. It has improved remarkably in the past few years to the point where the Bank can have confidence in monthly readings." 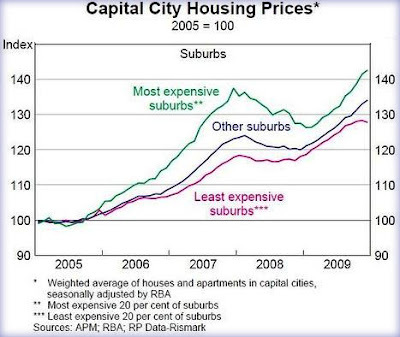 "In some ways house-price data is now more important than share-price data." "Seven out of ten houses are owner-occupied. If house prices go up and stay up most households become wealthier. Those seven out of ten households not only feel keener to go out and spend but become more able to go out and spend." The Bank minutes say the board decided to begin moving rates "closer to normal" in October. That "prompt start" gave it "flexibility in the pace at which to proceed". "On balance", its members concluded that "the evidence that had become available recently had confirmed that it remained appropriate for interest rates to move gradually towards normal levels". The Reserve Bank has lifted rates four times since October by a total of 1.00 percentage points, but extra hikes by Westpac and other retail banks bring the typical hike in mortgage rates to close to 1.20 points. But spread in a range between 6.74 and 7.01 per cent, the bank's standard variable mortgage rates are still well below the peak of 9.60 per cent reached in August 2008 ahead of the financial crisis. Analysis are expecting at least another two rate hikes in the year ahead and probably another four taking mortgage rates up to around 8 per cent with future moves dependent on the state of the economy. "There are nine more Board meetings this year and it looks to be a 50/50 call at each one," said Commonwealth Bank senior economist Michael Workman.
. The housing boom stopped in January?